The American Mathematical Society have created a system of online listings for people offering awards, fellowships, professional opportunities and other maths-related callouts. There’s a website at ams.org/opportunities, where you can search, browse, share, and post calls for fellowship and grant applications, prize and award nominations, and meeting and workshop proposals in the mathematical sciences. Current listings include calls for conference papers, an essay competition aimed at high school students, and a call for funding bids for activities relating to women in mathematics, among many others. The system is aimed at mathematics faculty/scientists, institutions, programs, postdocs/early-career mathematicians, postgrads, undergrads, high school students and teachers (so, pretty much anyone involved in maths), and we’ve cheekily used it to post a call for submissions of articles for our Irregulars column, where we feature guest posts from other authors. Awards, Fellowships and other opportunities, at the AMS website. Another year, another round of LMS prizes. Nominations for the 2014 prizes are now open. The Pólya Prize – awarded in recognition of outstanding creativity in, imaginative exposition of, or distinguished contribution to, mathematics within the United Kingdom. The Fröhlich Prize – awarded for original and extremely innovative work in any branch of mathematics. The Senior Anne Bennett Prize – for work in, influence on or service to mathematics, particularly in relation to advancing the careers of women in mathematics. 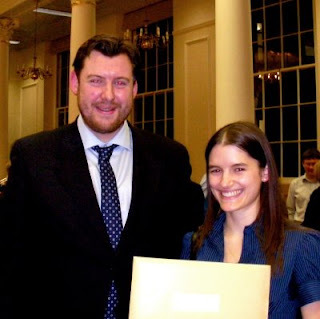 The Senior Berwick Prize – in recognition of an outstanding piece of mathematical research actually published by the Society during the eight years ending on 31 December 2013. The deadline is the 20th of January, 2014. Professor Barbara Keyfitz, President of the International Council for Industrial and Applied Mathematics (ICIAM), has issued a call for nominations for five prizes it will award at its 8th International Congress in Beijing in August 2015. IMA Prizes are awarded in UK universities which offer mathematics degrees, at the discretion of the university. In 2008 I conducted a survey of Prize giving practice among IMA University Representatives (27 responses; a 37% rate). All respondents awarded Prizes on some measure of academic excellence (all 22 who answered that question), either overall mark, or mark in an individual exam, project or coursework. Besides being recognition of academic excellence, the Prize also includes free IMA membership for one year. Now for the shocking news. Caroline Irwin, who many of you will know as Manager of the Membership Department, has put together some data for me on uptake of the free membership included with an IMA Prize and on the renewal rates of Prize Winners in their second year of membership. The numbers do not make comfortable reading. The number of Prize Winners claiming their free membership is down towards 40%. I find this very difficult to understand: the Prize Winner has the offer of free membership and all they have to do is fill out an application form! Further, the number of those Prize Winners claiming free membership who renew for the second year stands around one quarter. So six out of every ten IMA Prize Winners don’t join the IMA at all and nine out of ten IMA Prize Winners are not IMA members by the second year after receiving their award. Think about this: if you gave out IMA Prizes this year, it is very likely one of the two Prize Winners didn’t claim their free membership. Even if either did, it is very unlikely either of them will be an IMA member by 2010. I was asked recently whether I think it is worthwhile for the IMA to continue to award Prizes, given the cost to the Institute and relatively poor results. I believe Prize Giving can be a valuable activity for the Prize Winners, universities and the IMA and I will try to explain why. In November, I was welcomed at King’s College, London to attend the Prize Giving ceremony. I met one of the IMA Prize Winners, Janine Walker. It is not a criticism of King’s particularly, but I found Janine completely unaware of the IMA or of what she had won. I explained who the IMA are and the benefits of membership and she seemed enthusiastic about her award. I sincerely hope she went home, filled in the application form and is reading this article (Hello, Janine!). IMA Prizes are awarded at over 70 universities to, usually, two graduates at each. From the point of view of the IMA, this is a lot of Prizes to administer. However, if you consider there are around 4,500 graduates of mathematics each year, Janine can claim to be in a minority of around 3%. I hope she will claim proudly on her CV that she is an IMA Prize Winner and point out: “IMA Prizes are awarded based on academic excellence to around 3% of graduates each year.” This is a good way for her to put her head above the crowd. Since the Prize brings with it free IMA membership for one year, she can also claim to be a member of the IMA and thus committed to her ongoing development. I feel sure the claim to be an outstanding graduate with a commitment to professional development beyond the lecture theatre would be an enticing one for a prospective employer. I believe the benefits of the free membership go beyond simple CV enhancement. I didn’t join the IMA on graduation for cost reasons (and lack of awareness) but I revisited this two years later and joined. Prize Winners are awarded a free year and this is a kick-start to membership not offered to most graduates. As a member, the Prize Winner can begin to tap into the networking, mathematical interest and career development opportunities which can bring value to a member for their whole career, if they choose to make the most of their membership. So I believe the power of the Prize as a gentle prod in the right direction should not be overlooked. Besides the benefits to the individual Prize Winner, I believe Prizes can offer value to the universities that award them. Making students aware in the early stage of their degrees that awards are available for academic excellence and the benefits receiving such an award can have on their careers should help foster a culture of attainment. Indeed, respondents to my questionnaire have told me they value the IMA Prizes. As for the IMA, besides attracting Prize Winners to membership, being presented as a mark of excellence among the student population has to be good news in attracting all students and graduates to membership. So what can we do to make sure everyone gets the most out of Prize Giving? I think it is important that the general undergraduate population is aware of the IMA Prizes. Some respondents to my survey said that their university just prints a list of Prize Winners and sticks this on a notice board. I would like to see universities making a bit of a show of their Prize Winners. This is a genuinely worthwhile award if understood and used to its potential, both as recognition of achievement and as a fast-track introduction to the wider mathematical community offered by the IMA. If you work at a university where IMA Prizes are awarded in some ceremony (during graduation or a separate awards ceremony) and think it would be good to have an IMA representative in attendance please let me know and I will see what I can do (peter.rowlett@ima.org.uk). If I attend 70-odd Prize Giving ceremonies a year I will never have time to do the rest of my job, but I feel optimistic that we will be able to find a member who is willing to represent the IMA. I think it is important also that we work to ensure Prize Winners are aware of the benefits of what they have won (and of the benefits of membership to new members generally). Like most things in life, IMA membership is more valuable the more you try to get something out of it. If you work in a university, try to impress on your students and graduates the value of IMA membership. Outside universities, remember when you meet young mathematicians to find out if they are members of the IMA. If they aren’t, they should join! If they are, they might need a little push to get involved with the activities of the Institute. The Younger Mathematicians Conferences are an excellent place for early career mathematicians to start and I am always pleased to meet Younger Members who have been encouraged by their employer to attend these (perhaps with payment of travel expenses). The 2009 conferences are on 16 May in Oxford and 14 November in Birmingham. More details are available on the IMA website and there is a link on the student page at www.ima.org.uk/student. I visited London to attend the 9th Younger Mathematicians Conference. This was an enjoyable event as always and an excellent chance to catch up with early career mathematicians and students. A group of undergraduates from the Greenwich MathSoc (University Liaison Grant recipients) attended. The Conference heard from mathematicians working in mathematical finance and topics such as the maths of Google, the restoration of the Cutty Sark and much more. A conference report is being prepared for Mathematics Today so I will say no more. As I mentioned above, I attended the IMA Prize Giving at King’s College, London. This was a separate event from graduation and involved an Awards Ceremony of 45 minutes in which a range of Prizes across Engineering, Computer Science, Mathematics and Physics were awarded. This was followed by a wine and nibbles reception where I was able to meet one of the Prize Winners, Janine Walker (pictured) and her family. You might remember that the University Liaison project received some of its funding from a bequest of £20,000 from Professor Clement W. Jones, a founder member of the Institute, in 2007. The IMA chose to use the funds from the bequest to promote the applications of mathematics to University Mathematical Societies and to help students to be part of the mathematics community throughout their careers. The University Liaison scheme was designed to feature a series of ‘Clement W. Jones Lectures’ to be delivered at University Mathematics Societies. In November I travelled to Newcastle and gave a Clement W. Jones Lecture on “Coding and Cryptography”. This was an evening event in which I spoke on the history of a few methods of encrypting and decrypting messages and then split the audience into groups, who attempted to decipher each others messages. Speaking with students afterwards, the event seemed to have been well received. This is a format I am able to offer at other universities that are interested and I will be developing further Clement W. Jones Lecture formats in the coming months. The IMA East Midlands Branch runs evening talks of general mathematical interest very successfully but attendance by undergraduates is not usual. In December the IMA talk was at Leicester, where the Student Union Maths Society (S.U.M.S.) has recently been awarded a University Liaison Grant. I proposed to S.U.M.S. that they advertise the IMA Branch talk and they did so via a Facebook Event and other means. I am happy to report that S.U.M.S. members made up just over half the audience at “An Eulerian Journey” by Emma McCoy. You can find out what they thought of it in an article in the Student Section by Mark Gammon of S.U.M.S. Later in December I attended the British Society for the History of Mathematics Christmas Meeting, “Maths in View.” This aimed to look at the ways in which maths and specifically the history of maths have been portrayed in different media such as television and film (and podcasts!). I gave a talk with Noel-Ann Bradshaw of the University of Greenwich, who listeners will know presents a monthly Maths History piece for my podcast, Travels in a Mathematical World. Out talk covered my attempts to make the IMA more visible to students and Noel-Ann’s work writing and presenting the Maths History podcast episodes. You can download the podcast at www.travelsinamathematicalworld.co.uk. Just before Christmas I visited Catherine Richards House, the IMA HQ in Southend-on-Sea for the Secretariat Christmas lunch. Despite working for the IMA this was only my second visit to HQ and the first for almost 12 months so it was good to see everybody and catch up. Also in December I had my regular University Liaison project meeting and personnel appraisal. I am happy to report both went well. You can find out more about my work on the University Liaison initiative by visiting the IMA Student page or reading my blog, both via: www.ima.org.uk/student. In the student section this time is the piece I have mentioned above from Mark Gammon of the University of Leicester on attending the IMA East Midlands Branch talk and a piece from Felix Rehren of the University of Birmingham Mathsoc on activities supported by their University Liaison Grant. 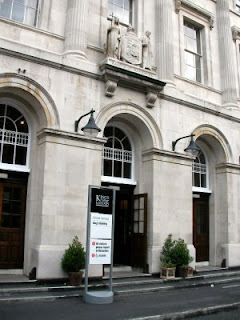 Today I attended Prize Giving at King’s College, London (pictured above). I was invited to attend as the IMA was giving two prizes to mathematics students. One of the students, Janine Walker (pictured below), was in attendance and I was able to meet her and her family afterward the ceremony. Universities that offer mathematics are able to offer IMA Prizes, generally to two of their graduating students at their discretion. These are often given out based on academic excellence – to the student with the top marks in exams, a project or overall. The Prize is a years membership of the IMA, although I believe it could offer far more to the student terms of prestige. My information suggests the IMA Prizes are offered at something like 74 universities, which is a lot Prizes but relative to the number of graduating mathematics students (something like 5000) this is a small number of graduates with this accolade. The correct wording on a CV could, I believe, produce a very positive effect. Practice for awarding IMA Prizes varies; at King’s there was an Awards Ceremony (seperate from Graduation) of 45 minutes in which a range of Prizes in Engineering, Computer Science, Mathematics and Physics were awarded. This was preceded by a tea and coffee reception and followed by a wine and nibbles reception.